"Yann Arthus-Bertrand is an aesthete with the soul of a moralist. He uses the beauty of the world to beguile you into a photograph in which a larger lesson awaits. His lesson is about the planet in jeopardy." 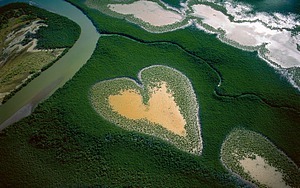 Yann Arthus-Bertrand is perhaps the best known aerial photographer on the planet. He has sold more than 3 million copies worldwide of his seminal photo essay Earth From Above, a decade-spanning attempt to photograph all the vistas of the planet from the sky, whether by helicopter, hot air balloon, or anything else that flies. Arthus-Bertrand seeks to uncover the story behind the landscape, not just create a pretty picture. Indeed, his subjects are not always photogenic -- his prints show poverty and strife as well as green tranquility; and everywhere in his work is the encroaching hand of humanity and its enterprise. He keeps close track of the coordinates of his locations, so other photographers may track their progress over time. His newest project takes a different view -- focusing more closely on the people who live on this planet. Called 6 Billion Others, the project was a centerpiece of Pangea Day 2008. With Luc Besson, he is working on the feature-length documentary Boomerang, to be shot in 60 countries. He founded the Altitude Agency in 1991, which was the world’s first press agency and images bank specialised in aerial photography (500,000 pictures taken in more than 100 countries by more than 100 photographers). In 2000, his "Earth from Above" free exhibition was set up on numerous big posters on the gates of Jardins du Luxembourg in Paris. It then travelled worldwide from Lyon to Montreal, to 110 cities and was visited by 120 million people. In 2008, Earth from Above was released on the DVD.